Explanation: Which is older -- the rocks you see on the ground or the light you see from the sky? Usually it’s the rocks that are older, with their origin sediments deposited well before light left any of the stars or nebulae you see in the sky. However, if you can see, through a telescope, a distant galaxy far across the universe -- further than Andromeda or spiral galaxy NGC 7331 (inset) -- then you are seeing light even more ancient. Featured here, the central disk of our Milky Way Galaxy arches over Toadstool hoodoos rock formations in northern Arizona, USA. The unusual Toadstool rock caps are relatively hard sandstone that wind has eroded more slowly than the softer sandstone underneath. 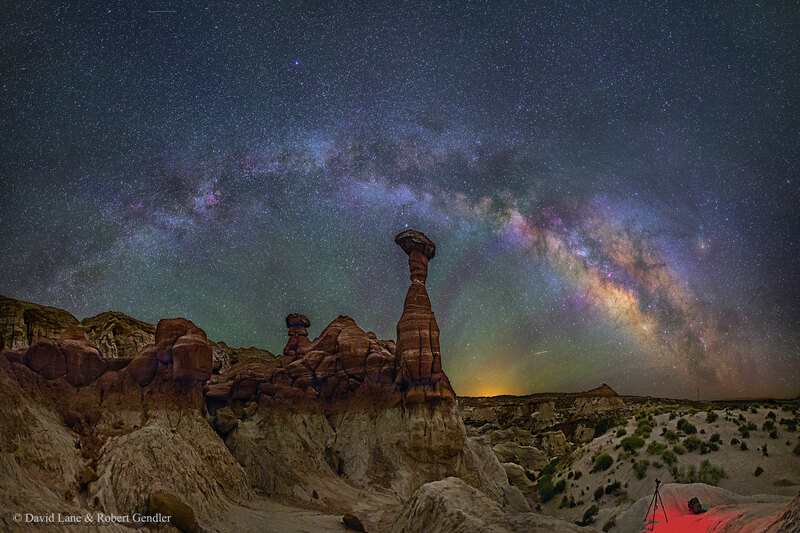 The green bands are airglow, light emitted by the stimulated air in Earth's atmosphere. On the lower right is a time-lapse camera set up to capture the sky rotating behind the picturesque foreground scene.